Six of us from Denen Grace Chapel spent three days in post-tsunami relief work in Miyako, Iwate prefecture. Once again, we worked in partnership with the 311 Network and Miyako Community Church. 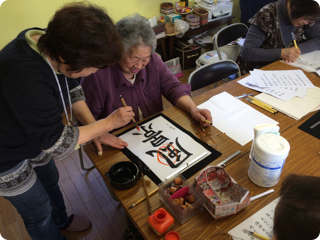 Mrs. U shared here calligraphy skills, leading two classes in two separate temporary housing areas. 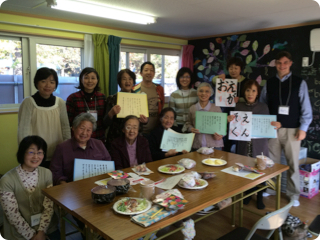 Participants enjoyed writing Bible verses and simple Japanese characters. We shared a delicious taco rice lunch with our team prepared. In addition, we spent Sunday morning at Miyako Community Church. Pastor Kevin preached a message, and the team shared a special song. Pastor Iwatsuka lead us on a visit to the scenic shore of Taro, the fishing port, and the seawall broken by the tsunami. We continue to pray for the ongoing Christian testimony shown in the temporary housing areas through the work of many volunteers, both in Japan and from abroad.